And although small in body, in works he was great. John is numbered among the greatest of the Egyptian ascetics. "Kolovos" means "dwarf", for he was of little stature. He came to Scetis with his brother Daniel and, with the greatest zeal, devoted himself to such asceticism that Daniel had to urge him to moderation. 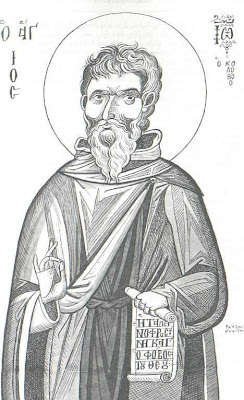 John was a disciple of Saint Pambo, and was later the teacher of Saint Arsenios the Great. 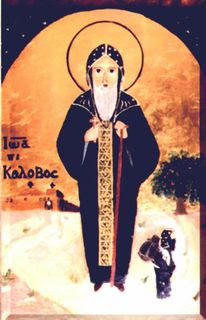 His fellow disciple under Saint Pambo was Saint Paisios the Great. 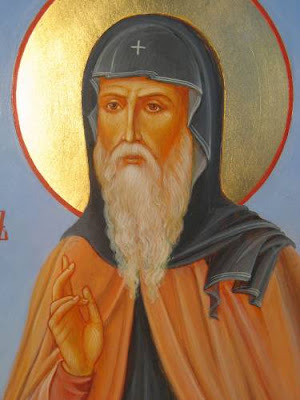 Once, when he and Paisios were discussing what kind of asceticism to undertake, an angel of God appeared to them and commanded John to stay where he was and instruct others, and Paisios to enter the wilderness and live as a hermit. In order to test John's obedience, Saint Pambo ordered him to water a dry stick planted in the ground until it turned green. Without hesitation or doubt, John watered this stick daily for three whole years until by the power of God, it grew green sprouts and brought forth fruit. Pambo then gathered the fruit from this tree, brought it to church and distributed it among the brethren saying: "Draw near and taste of the fruit of obedience!" John the Dwarf had many disciples. Some of his wise sayings have been preserved. He entered into rest peacefully and took up his habitation in the joy of his Lord. 8. It was said of him (Abba John the Dwarf) that one day he was weaving rope for two baskets, but he made it into one without noticing, until it had reached the wall, because his spirit was occupied in contemplation. 17. 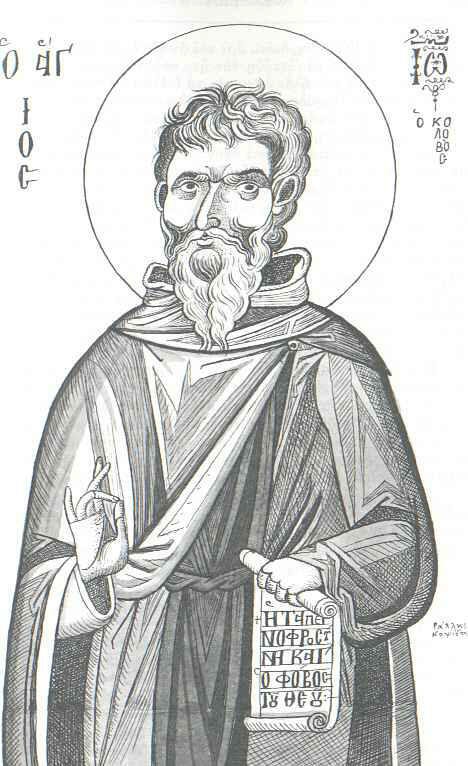 Abba Poemen said that Abba John said that the saints are like a group of trees, each bearing different fruit, but watered from the same source. The practices of one saint differ from those of another, but it is the same Spirit that works in all of them. 20. An old man came to Abba John's cell and found him asleep with an angel standing above him, fanning him. Seeing this, he withdrew. When Abba John got up, he said to his disciple, 'Did anyone come in while I was asleep?' The disciple said, 'Yes, an old man.' Then Abba John knew that this old man was his equal, and that he had seen the angel.